So, yeah! I'll do those artsy versions of your name thing if anyone likes. Specify what name you'd like me to do, please. I'll post a sheet of examples that I was messing with today once this is up. Yes please! Leafpool as mine. Yes!!! Agent Winter for mine. Here's the example paper. I did this in class without any proper materials, so don't worry, there'll be more colors. In fact, let me know what colors and styles you'd like and I'll do my best to accomodate. 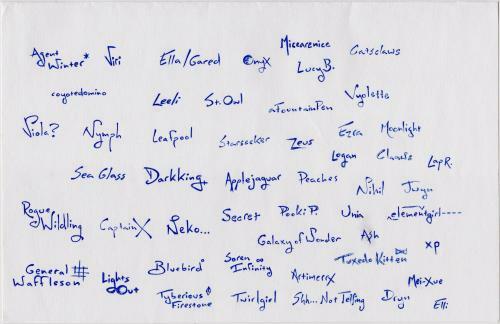 My apologies to those I missed or misspelled on this sheet. I was doing it from memory, and my memory can be... Unreliable. These are so cool, coyote! Would you make one for me? I would just like "Silverwaxwing" if that works for you...? Thank you! ashdhasdgfasfhdgk My name is so COOOOOOOOOL! I love how you wrote it Coyote, it's amazing! I love these! I've been working on faulligraphy (i have no idea if I spelled that right) a lot recently, and I really appreciate those. I'd love it if you did either me or Celeste. Thanks so much! Can I please have one with just the name Gracia? Thanks so much! Whoa, you have such nice handwriting! Could I have one with my name and location? Thanks! Working on 'em. My perfectionism has made me do AW's, June's, and Leafpool's like at least 3 times each, so you may get more than one.